The sigma receptors σ1 and σ2 bind to ligands such as 4-PPBP, SA 4503, ditolylguanidine, dimethyltryptamine and siramesine. σ–receptors were once thought to be a type of opioid receptor, because the d- stereoisomers of the benzomorphan class of opioid drugs reduced coughing, as do some other opioid derivatives such as dextromethorphan. However, such drugs had no effects at μ (Mu), κ (kappa), or δ (Delta) receptors. However, pharmacological testing indicated that the σ-receptors were activated by drugs completely unrelated to the opioids, and their function was unrelated to the function of the opioid receptors. For example, phencyclidine (PCP), and the antipsychotic haloperidol may interact with σ-receptors. Neither phencyclidine nor haloperidol have any appreciable chemical similarity to the opioids. 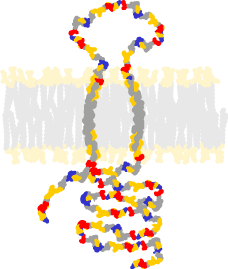 When the σ1 receptor was isolated and cloned, it was found to have no structural similarity to the opioid receptors. At this point, they were designated as a separate class of receptors. The function of these receptors is poorly understood though an endogenous ligand, dimethyltryptamine, was found to interact with σ1. Activation of σ–receptors by an agonist ligand may induce hallucinogenic effects and also may be responsible for the paradoxical convulsions sometimes seen in opiate overdose. Drugs known to be σ–agonists include cocaine, morphine/diacetylmorphine, opipramol, PCP, fluvoxamine, methamphetamine, dextromethorphan, and the herbal antidepressant berberine. However the exact role of σ–receptors is difficult to establish as many σ–agonists also bind to other targets such as the κ-opioid receptor and the NMDA glutamate receptor. In animal experiments, σ–antagonists such as rimcazole were able to block convulsions from cocaine overdose. σ–antagonists are also under investigation for use as antipsychotic medications. Physiologic effects when the σ–receptor is activated include hypertonia, tachycardia, tachypnea, antitussive effects, and mydriasis. Some σ–receptor agonists—such as cocaine, a weak σ–agonist—exert convulsant effects in animals. Behavioral reactions to σ–agonists are rather heterogeneous: some individuals find σ–receptor agonists euphoric with significant anti-depressive effects. Other individuals, however, experience dysphoria and often report feelings of malaise or anxiety. Recently selective σ–receptor agonists were shown to produce antidepressant-like effects in mice. ^ Yang S, Bhardwaj A, Cheng J, Alkayed NJ, Hurn PD, Kirsch JR (2007). "Sigma receptor agonists provide neuroprotection in vitro by preserving bcl-2". Anesth. Analg. 104 (5): 1179–84, tables of contents. ^ Fontanilla D, Johannessen M, Hajipour A, Cozzi N, Jackson M, Ruoho A (2009). "The Hallucinogen N,N-Dimethyltryptamine (DMT) Is an Endogenous Sigma-1 Receptor Regulator". Science 323 (5916): 934–937. ^ Skuza G, Rogóz Z (2006). "The synergistic effect of selective sigma receptor agonists and uncompetitive NMDA receptor antagonists in the forced swim test in rats". J. Physiol. Pharmacol. 57 (2): 217–29. ^ Leonard BE (2004). "Sigma receptors and sigma ligands: background to a pharmacological enigma". Pharmacopsychiatry. 37 Suppl 3: S166–70. ^ Guitart X, Codony X, Monroy X (2004). "Sigma receptors: biology and therapeutic potential". Psychopharmacology (Berl.) 174 (3): 301–19. ^ Fontanilla D, Johannessen M, Hajipour AR, Cozzi NV, Jackson MB, Ruoho AE (2009). "The hallucinogen N,N-dimethyltryptamine (DMT) is an endogenous sigma-1 receptor regulator". Science 323 (5916): 934–7. ^ Wang J, Mack AL, Coop A, Matsumoto RR (November 2007). "Novel sigma (sigma) receptor agonists produce antidepressant-like effects in mice". Eur Neuropsychopharmacol 17 (11): 708–16. ^ Vollenweider FX, Leenders KL, Oye I, Hell D, Angst J (February 1997). "Differential psychopathology and patterns of cerebral glucose utilisation produced by (S)- and (R)-ketamine in healthy volunteers using positron emission tomography (PET)". European neuropsychopharmacology: the journal of the European College of Neuropsychopharmacology 7 (1): 25–38. ^ Klepstad P, Maurset A, Moberg ER, Oye I (October 1990). "Evidence of a role for NMDA receptors in pain perception". European Journal of Pharmacology 187 (3): 513–18. ^ Calabrese JR, Suppes T, Bowden CL, Sachs GS, Swann AC, McElroy SL, Kusumakar V, Ascher JA, Earl NL, Greene PL, Monaghan ET (2000). "A double-blind, placebo-controlled, prophylaxis study of lamotrigine in rapid-cycling bipolar disorder. Lamictal 614 Study Group". J Clin Psychiatry 61 (11): 841–50. ^ Ng F, Hallam K, Lucas N, Berk M (2007). "The role of lamotrigine in the management of bipolar disorder". Neuropsychiatr Dis Treat 3 (4): 463–74. ^ Zhang CL, Feng ZJ, Liu Y, Ji XH, Peng JY, Zhang XH, Zhen XC, Li BM (2012). "Methylphenidate enhances NMDA-receptor response in medial prefrontal cortex via sigma-1 receptor: a novel mechanism for methylphenidate action". PLoS ONE 7 (12): e51910. ^ Kamei, J (Oct–Dec 1996). "Role of opioidergic and serotonergic mechanisms in cough and antitussives.". Pulmonary pharmacology 9 (5-6): 349–56. ^ Maeda DY, Williams W, Bowen WD, Coop A (January 2000). "A sigma-1 receptor selective analogue of BD1008. A potential substitute for (+)-opioids in sigma receptor binding assays". Bioorganic & Medicinal Chemistry Letters 10 (1): 17–8. ^ Wu HE, Hong JS, Tseng LF (October 2007). "Stereoselective action of (+)-morphine over (-)-morphine in attenuating the (-)-morphine-produced antinociception via the naloxone-sensitive sigma receptor in the mouse". European Journal of Pharmacology 571 (2-3): 145–51. ^ Kotagale NR, Mendhi SM, Aglawe MM, Umekar MJ, Taksande BG (2013). "Evidences for the involvement of sigma receptors in antidepressant like effect of quetiapine in mice". Eur. J. Pharmacol. 702 (1-3): 180–6. ^ Xu YT, Kaushal N, Shaikh J, Wilson LL, Mésangeau C, McCurdy CR, Matsumoto RR (2010). "A novel substituted piperazine, CM156, attenuates the stimulant and toxic effects of cocaine in mice". J. Pharmacol. Exp. Ther. 333 (2): 491–500.